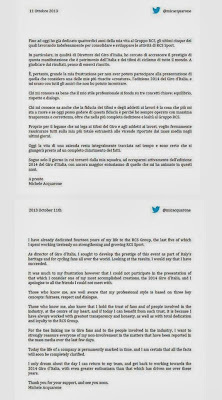 Michele Acquarone, Managing Director at RCS Sports (owner of the Giro d'Italia, MSR, Il Lombardia, +), was suspended earlier this month as a precautionary, "non-disciplinary", measure while an investigation of a shortfall of 13 million euro is investigated. 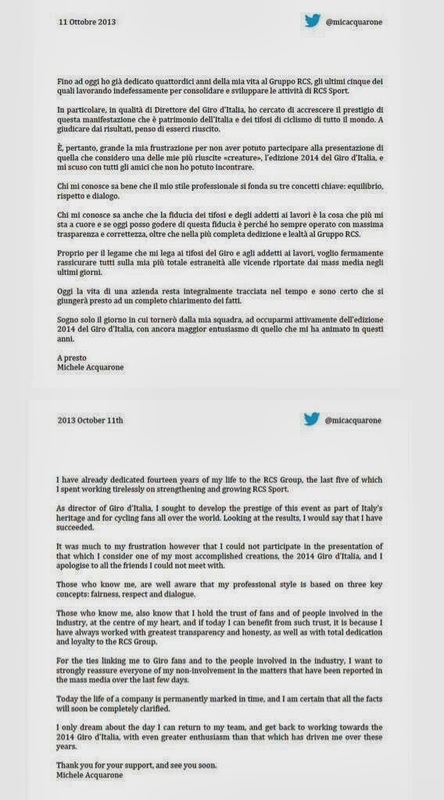 He was not present at the 2014 Giro d'Italia presentation on Monday, October 7th. Larry writes - While I understand Acquarone's sitting at home with nothing to do, taking his case to the twitterverse smacks of desperation. Perhaps he should get a bicycle and ride it instead? This mess is going to play out one way or another, it's hard to see how tweets are going to make any difference to those who must decide his fate. BRING BACK ZOMEGNAN!